L: 34" x W: 34" x H: 18"
Allure Glass Coffee Table Give your living room a cool modern twist with this on-trend Allure glass coffee table. Its simple yet strikingly unique design features a triangular-shaped glass tabletop held up by 3 curved legs with a rich hazelnut finish. Give your living room a cool modern twist with this on-trend Allure glass coffee table. Its simple yet strikingly unique design features a triangular-shaped glass tabletop held up by 3 curved legs with a rich hazelnut finish. It broke when my husband put his feet up on it. I was very surprised, I thought it was a lot sturdier. The glass shattered all over the living room. I would not recommend to a family with small children. 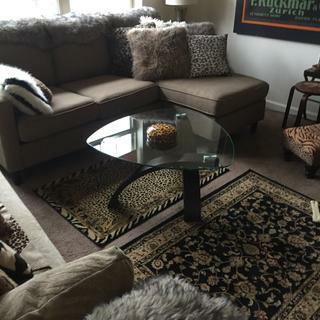 Bought the coffee table and 2 matching end tables. Excellent construction! Tables are of high quality and the look it gave to my living room was unbelievable! It still has the wow factor when we come into our house! Love them!! I love it so much that I'm looking to buy the end tables. Since I'm a budget shopper looking for a good sale. Not your mother's coffee table! The rounded triangle design allows a multitude of positionings with the couch yet still allows easy access to sit down. Works well in a small apartment. Glass top makes it feel smaller than it actually is. Looks like it costs way more than it did! The combo of wood & glass means it goes with both modern and traditional living rooms. This is a unique piece that makes a statement in any room. We paired it with some simple furniture and the piece really serves as the focal pont of the room. Very cool, affordable and great quality! I absolutely love this table. It's very unique. We get a lot of compliments on it. One of the best buys we've made. Is a beautiful piece of furniture that makes my living area look great!!!! I will recommend this table for any living room. Elegant table. It made my home look sophisticated. Great pieces of furniture,highly recommend! Love the coffee and end table!Fits perfectly,easy to assemble ,quality wood and glass! Love my new coffee table. Great look! Fitting easily into numerous design settings. It is the finishing touch this space needed. Looks amazing. Perfect coffee table to go with our new sectional. The odd shape of this table was a great design piece that fit in the area we wanted. It also gave that area a nice stand out style and cool look. Excellent table, easy to assemble and great value for the dollar! We needed a small table in front of a sectional couch This fit the bill. Large enough to put drinks and food on it, and small enough not to block the couch and overpower the room. The table was easy to assemble, only 9 screws. In needed a small coffee table to work with our small sectional and this fit the bill. The glass top makes it feel open. The price was good too. This coffee table came in as scheduled. The assembly was, easy, and it looks great. Just what we were looking for. I received many compliments on this particular coffee table. We are so pleased with this purchase. It adds dimension and a touch of modernism without being too-too. It's just right with our more traditional white sofas. Stylish addition to our living room. The Allure tables were easy to assemble and are good accents for our somewhat eclectic decor and will hopefully be easy to keep clean. acouple of the legs on the set had flaws of discoloration on the bottom of the legs. But overall nice looking set. I wouldn't have purchased then if not on sale. Nice looking coffee table for a small space. Bought it from the store and it came assembled -- but it is unstable. If you move it, the legs and top are not attached tightly enough. I'm concerned abut them coming to tighten it up, for fear that it will loosen, again, if moved around, as for vacuuming underneath, or adjusting its position in the room, or having the rug cleaned, or moving elsewhere. I know R & F will come and tighten it up, for now. I bought the extended warranty because of concerns expressed in the reviews about the quality of the legs. Stylish, yes. Perfect for a small space, yes. The durability has been called into question by more than one buyer. BEST ANSWER: This sleek design is manufactured in China. Magnussen Home sources their designs from only the finest home furnishings manufacturers, many in the Far East and Central America. Their technologically advanced factories facilitate quick shipment as well as great value and gorgeous furnishings. Does this table come already assembled? BEST ANSWER: Hello Carol! With Raymour & Flanigan's White Glove Delivery service, delivery includes all necessary assembly and a comprehensive quality inspection of your furniture prior to it being delivered to your home. Some pieces may require final assembly in your home due to their size or configuration. Yes, it does, but the tables aren't worth the money. The legs are not wood, they are particle board made to look like wood and the table unscrews from the glass if you move it to vacuum, etc. It doesn't but the delivery men set it up. Please be sure that they set it up properly as it will lean (glass surface) if the legs are not attached properly. No, it comes in 4 pieces. Brackets are already attached to the table for the legs, so it’s a straightforward assembly. No, there are 2 or 3 screws that hold each leg into the silver disc attached to the glass. Needed assembly but very easy. Love the table! can you buy replacement legs? BEST ANSWER: For assistance with replacement hardware, please contact Customer Care at 866-383-4484, option 2. Thanks for your answer, Christine! Yes, you can. Yould order them through the customer service department. There was a defect in mine and i was able to replace them. Hope this was useful. BEST ANSWER: The glass is tempered. Does it matter what leg goes on what holes? I have no directions and I am having a hard time putting them on. BEST ANSWER: Our Customer Care Center would be glad to assist you. They can be reached at 1-866-383-4484 option #2.